Nihon Falcom created a phenomenal action-RPG series with Ys. However, they wanted to step outside of Ys and create a new action-RPG; one that ties into the Xanadu series, but isn’t like Xanadu or Ys. Thus, Tokyo Xanadu was born. Tokyo Xanadu is certainly nothing like Ys in terms of story, setting, quests, etc., albeit it does share combat similarities with Ys. That said, if you didn’t know the developer was the same between the two games, you would never make the connection. In that regard, mission accomplished, Nihon Falcom. Tokyo Xanadu takes place in modern day Tokyo (big shock there), starring high school students. It’s almost a Persona 5 meets Ys, but there are not enough similarities to call it a Persona 5 copycat (not to mention the game released two years before P5). The main character is Kou Tokisaka, who accidentally stumbles upon learning of a supernatural plane of existence. This other plane is filled with monsters called Greeds, which are affected by strong emotions in our own world. When someone has an extremely strong emotion, the planes merge, forming an Eclipse. If a person or even an object is too close to an Eclipse Gate when one forms, they’ll be sucked into the Eclipse where Greeds will eventually absorb their spirits. 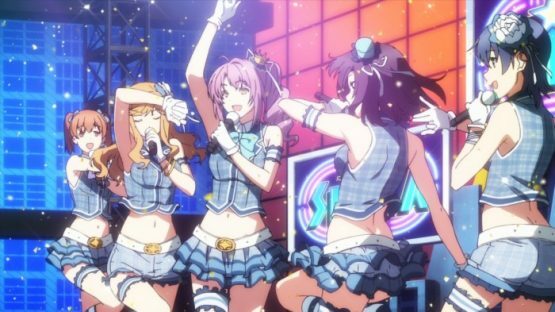 Kou, along with Asuka Hiiragi and eventually other friends, try to help the people of the Morimiya suburb repair their emotions and prevent gates from appearing. In addition, they’re investigating why so many Eclipses are appearing in Morimiya in just these few months. The premise really is an interesting one, but the execution is a bit of a mess. Each chapter generally follows the same formula until Kou has recruited his entire party. The chapter starts with the kids all in school, and then when school is out, Kou has some free time before he goes to his part-time job of the day. During that time, Kou can go shopping, upgrade his Soul Device (weapon) complete side quests, run Eclipse dungeons again for a higher score and more loot, read books, learn to cook, play mini-games like skate park courses or earn medals at a casino, and/or complete friendship quests. After completing initial Eclipse dungeon runs, Kou will receive a few Affinity Shards. He can use those shards to do friendship quests, but he has to pick and choose these quests. Once the story progresses, the friendship quests close. The closer Kou becomes with various friends, other sub-events will unlock as well as different cut scenes. Before this free time ends, sometimes Kou has Eclipse investigations to help with, but the chapter or the chapter section ends when Kou starts his part-time job. It’s great that there are so many options for players to take when not dungeon crawling, but it feels very thrown together. It’s almost as if the devs had a meeting to discuss what were typical elements of a high school-set RPG and couldn’t choose which they liked best, so they threw them all in. They aren’t terrible, but it’s too much going on in the background. Fortunately, most of the game is centered on Eclipse dungeon runs and combat. It’s hack-n-slash, naturally, but the strategy comes into play with the characters you choose to use. Only three members can go with you, but you can only control one of them at a time. Each individual character’s weapon, called a Soul Device, is strengthened by one particular element. When players lock on to an enemy, the enemy’s element weakness will appear. If you’re playing as Kou, who is strong with fire, but come across a Greed that is weak against steel, then Kou needs to be swapped out with Yuuki. It’s of course possible to beat a Greed with different elements, but using the proper element grants the player an Elemental Kill, which affects the loot dropped by the Greed as well as the player’s ranking at the end of the stage. Not to mention, it’s outright easier to battle Greeds when using the elements they are weak against. This elemental strategy becomes more complex as more characters join Kou’s party. There may be five different elemental enemies in the Eclipse, but you can only get Elemental Kills with three. 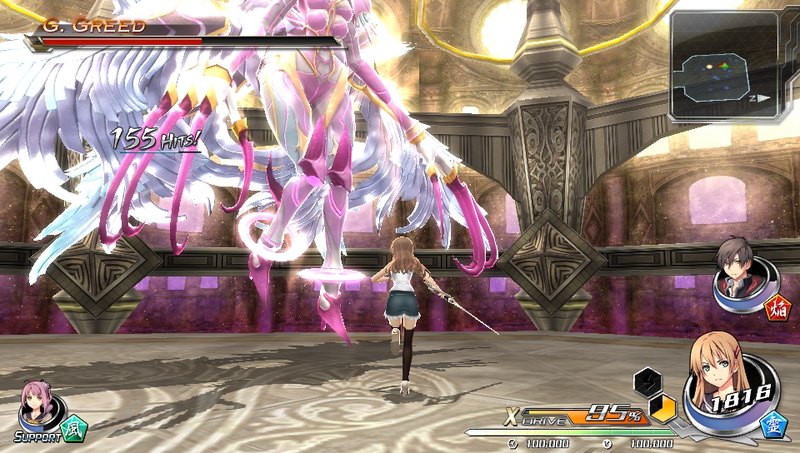 Each character also has a different style of combat that can influence strategy choices. Hiiragi is best suited for ranged attacks, whereas Sora is a close-combat specialist. Yuuki is a close-combat specialist too, and his warhammer deals a massive amount of damage. The caveat there, though, is that Yuuki moves far more slowly than Sora. Sora may not have the punch Yuuki has, but she can get in enough punches during the time it takes Yuuki to swing once to match his damage. Neither is better than the other; it all comes down to player’s preferred combat style. While the combat itself is rather fun and a bit mindless, the challenge is lacking. After 25 hours in on Normal, I realized that I never died once. None of my party members ever died, either. I bumped the difficulty up to Hard, and I was treated to a difficulty level far closer to what Normal should be. Those who crave a challenge and real strategy in their action-RPGs should start at a minimum with Hard. If you enjoy completely mindless combat, keep it on Normal. I can’t imagine how Easy would be. I’m guessing ranged and power attacks aren’t necessary at all, and it’s literally a “press X to win” experience. Even when the combat doesn’t provide a challenge, the dungeons themselves do. Many of the dungeons are straightforward, requiring exploration to find treasure chests and switches to unlock doors. However, there are plenty of dungeons that bring in platforming puzzles to the mix. Since the game is in a third-party point-of-view, these can be tricky to maneuver, especially since your characters will not grab ledges. What really cracked me up with this game was the overuse of the Xiphone. Yes, that’s a cell phone all the cool kids carry that is a direct parody of another popular phone model. It does everything you’d expect it to, like call and text friends, play voicemails, and have access to eBooks and a social media app. The Xiphone also has apps strictly for dealing with Eclipses. Hiiragi pulls out her Xiphone when she needs to perform a spell outside of an Eclipse. She gives Kou an Eclipse tracker for his phone. The phone is also used to upgrade Soul Devices. There’s simply nothing the Xiphone can’t do. Even better, every time Hiiragi introduces a new app they can use for their Eclipse work, Kou immediately questions how such technology through a phone is possible. It’s always fun when a game pokes fun at itself. Tokyo Xanadu is a great fit for the Vita, as the repetitive chapter formula seems to be made for short bursts of play. If you’re going to pick it up at all, buy the Vita version; don’t wait for the PS4 release later this year. Those looking for a fun little action-JRPG for the Vita will most certainly enjoy their time in Morimiya. You’ll probably also never look at a camera store the same way ever again. 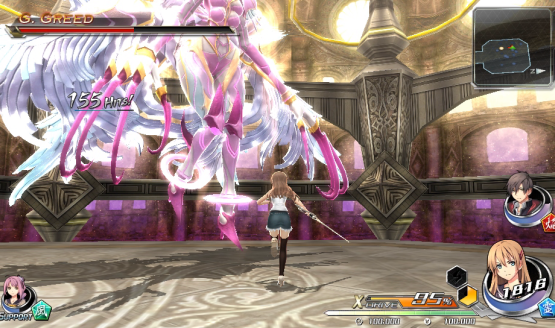 Tokyo Xanadu review code provided by publisher. For more information on scoring please see our Review Policy here.